Fitzness Friday Workout__PUMP IT UP! Happy Friday, everyone! 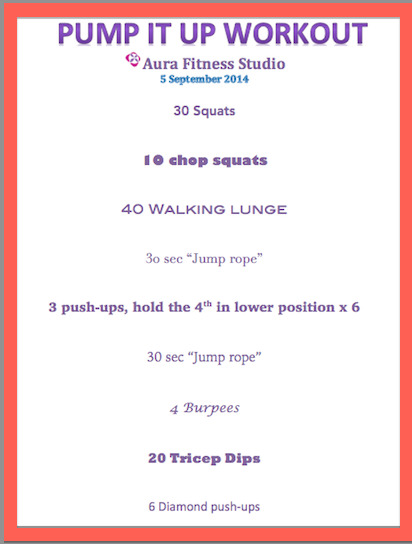 Here's a workout I designed with the song, "Feel Your Love" by Kim Sozzi in mind. It's a fun, high-energy song, perfect to celebrate the Chinese Labor Day (3 day weekend) ahead. I'm traveling this weekend for a yoga retreat. It's going to be great! Where will you be exercising this weekend? If you're in the New York City area, check out the US Open this weekend in Flushing!